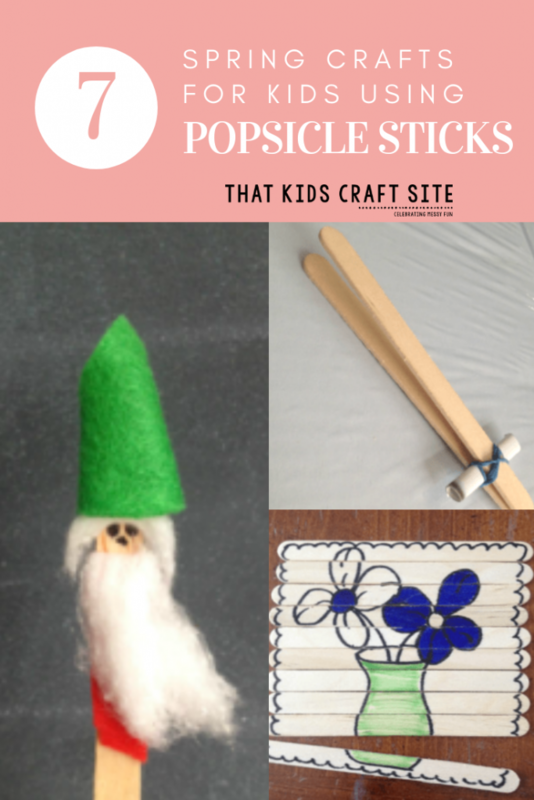 Simple spring crafts that use popsicle sticks as their base are so fun to make! It’s hard to believe, but spring will soon be upon us. 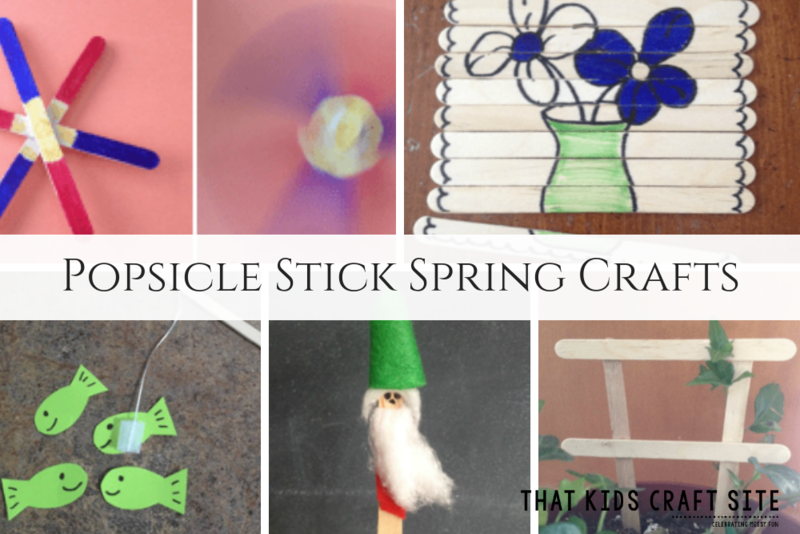 It’s a great time to bust out the craft box and get into the spring spirit with some fun, easy projects using Popsicle sticks. Bugs and worms are interesting for kids to look at, but some kids don’t really want to touch them! Show them how to make these easy tweezers with a small rolled up piece of paper, a rubber band and two Popsicle sticks. If you ever go to a Chinese restaurant with your kids, you can usually request children’s chopsticks that are made the same way. These pretty little fans can be made with different colored construction paper and decorated with crayons or markers. Just fold a 2 ½” by 6” piece of paper accordion-style making each column the width of a Popsicle stick (about ½” for small Popsicle sticks). Glue a Popsicle stick onto every other fold leaving about 2” at the bottom. Once the glue dries, fold the accordion and use a small rubber band to secure the sticks together at the bottom. Carefully open the sticks to reveal your beautiful paper fan. This one is my favorite! You will need one Popsicle stick, one cotton ball, two small scraps of felt or paper in contrasting colors, and a marker. Grab the Popsicle stick and cover the middle section with one small scrap of felt or paper. This is your gnome’s shirt. Draw a set of eyes and a nose above the shirt line. Pull apart the cotton ball to make hair and a beard for your gnome. Glue the hair above your gnome’s eyes and a bit below his nose for his beard. Make a cone shape out of the other piece of felt and glue it around the top of the Popsicle stick as a hat. Stick your little gnome in your garden to welcome the new buds! My youngest son just loves this one. Glue 3 Popsicle sticks together in their centers so that the ends are equidistant from each other- like spokes of a tire. Let it dry. Color each spoke in your favorite flower colors. (If you use two primary colors, you can see them mix together to form a secondary color when you spin your flower!) You can even color the center of the spinner a different color if you’d like. Flip your spinner over and glue on a small button to help it spin. Once it dries, flip it back over and spin away! Bring the beauty of spring indoors with a beautiful potted ivy plant or miniature rose bush. Make a trellis for it out of four Popsicle sticks by simply gluing them together so they look like a ladder. Make the bottom of the ladder closer together than the top so that it looks like an actual garden trellis. All you need for this game is one Popsicle stick, dental floss, clear tape and some scraps of paper. Cut out a few small fish shapes out of paper. Tie a piece of dental floss to the end of your Popsicle stick. Make a roll of clear tape and stick it to the other end of the floss. Now you can “fish” for your paper fishies by letting them get stuck to the tape. Lay 10 Popsicle sticks together side by side. Lay a piece of tape across the square to hold it together temporarily. Flip the flat square over and draw a spring themed picture on it with crayons or markers. Remove the tape and scramble the sticks. Ask your friend to put the puzzle back together. Using the back of your puzzle, draw a combination of one, two and three dots on the ends of each stick. You can use these to play a mini game of dominoes by matching the ends together. Try one or more of these crafts to help fill those inevitable rainy days of spring. Then get outside and enjoy all that nature has to offer! 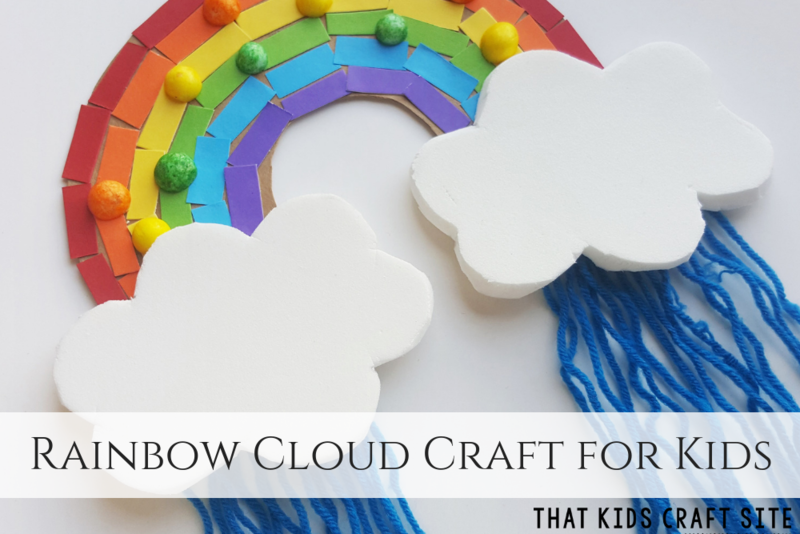 If you made one of the great crafts above, snap a picture and tag us on Instagram @ThatKidsCraftSite! We’d love to see your work! 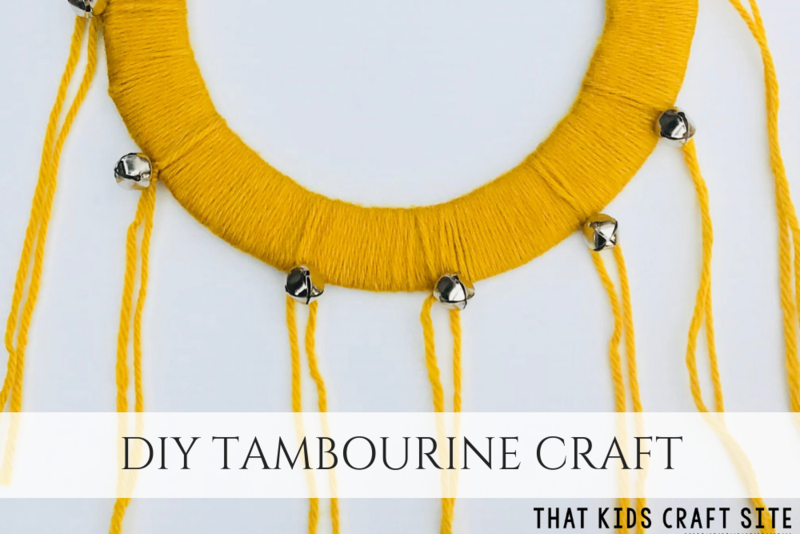 Make Your Own DIY Tambourine!